Bottle-baby goats can happen if your doe abandons or can't feed a kid. Some people also buy bottle babies to raise for their herd. Not surprisingly, many milk replacers and milk replacer recipes are available. No one seems to have a definitive answer when it comes to feeding a baby goat. The kid needs colostrum within the first 24 hours of life. Colostrum has special nutrients and maternal antibodies that will help protect the kid through its first weeks of life. If the mother dies, it's up to you to furnish colostrum to the baby goat. The best colostrum is from a goat—get it fresh or frozen and feed it to the youngster as soon as possible. The next best thing is the colostrum replacement sold in stores. Don't use colostrum supplement, as this isn't nutritionally adequate for your bottle baby. If you can't find either, Storey's Guide to Raising Dairy Goats has a homemade recipe you can follow. Mix well 3 cups milk, 1 raw egg, 1 teaspoon cod liver oil and 1 tablespoon sugar. Neither this nor the store-bought colostrum will provide maternal antibodies, but they will provide the necessary nutrition. Nigerian Dwarf and Pygmy bottle babies don't necessarily need fancy recipes. Most babies can do just fine on goat's milk or cow's milk you find in the store. Do not use canned or powdered milk, as these can cause digestive upsets and diarrhea known as scours. Fias Co Farms recommends that you add 3 tablespoons of corn syrup per gallon of cow's milk. 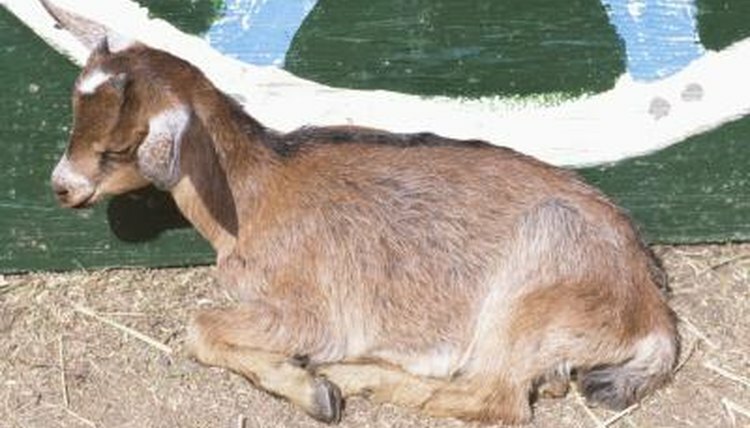 One formula comes from Prairie Peace Farm and is similar to other goat baby formulas around. Mix 1 gallon of milk with 1 can of evaporated milk, 1 cup of buttermilk and 1 raw beaten egg. The buttermilk may contain enough good bacteria to keep the kids from scouring. Dwarf goat kids tend to eat less than their full-size counterparts, but you'll have to judge according to your kid's appetite and condition. Don't skimp if the kid is hungry, but don't overfeed either and allow him to bloat. A good measure is that the kid is gaining weight but not waddling away with a distended stomach. Fias Co Farms recommends that you bottle-feed for almost four months; Storey's Guide to Raising Goats recommends weaning at 8 to 10 weeks. If you plan on bottle feeding for 8 to 10 weeks, Storey's Guide recommends feeding 12 to 24 ounces three to four times a day for the first week, 36 ounces split two to four times the second week, 32 ounces split two to three times a day with free choice hay and water for the third and fourth weeks, and 32 ounces split two times a day plus hay, grain and water until weaning. Fias Co Farms recommends that you feed 6 to 12 ounces per feeding for four feedings the first week. After that, feed 10 to 12 ounces per feeding for 4 feedings the next week. Over the next two months, feed 10 to 12 ounces per feeding for three feedings. Then 10 to 12 ounces per feeding for two feedings for one month. Then drop down to a single feeding of 10 to 12 ounces for two weeks. You should be adding hay, grain and water during the four months. University of Maryland Extension: Colostrum: "Liquid Gold"
Can You Feed a Guinea Pig Pet Milk?